Imagine an animated series that took Jonny Quest and Seventies pop culture, blended it together with some of the sharpest writing on television and unleashed it on the world and you’d have the beginnings of the beloved television show, The Venture Bros.
Last night, Adult Swim aired a new The Venture Bros. special, From the Ladle to the Grave: The Shallow Gravy Story, which encapsulated the rise and fall of the music group Shallow Gravy in a mere eleven minutes. I was lucky enough to chat with the two geniuses behind the series, Doc Hammer and Jackson Publick, who took some time out of their very busy schedule to discuss the special, the series and potential spin-offs. Let’s start with the present, with From the Ladle to the Grave: The Shallow Gravy Story. It really felt like it could have been the subplot for an entire season. What was the choice to encapsulate it as a short? Hammer: Because it really isn’t the plot for an entire season. 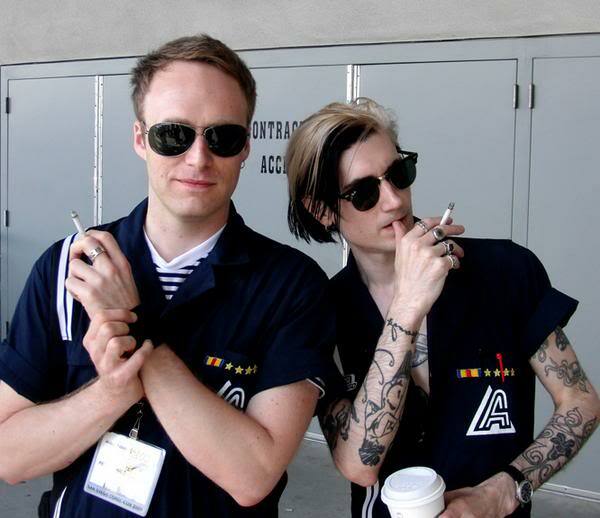 We didn’t really want to spend an entire season talking about some ridiculous band that Hank and Dermott Fitctel have. Publick: I think that we’re totally well aware that it’s a departure from what our show should actually be about, as much as we want to include it. Because it’s such a departure, but it’s something that we’re interested in, the fifteen minute short is the perfect place to make those jokes and then we can, you know, not have to deal with it. We’re not moving on to a spin-off here, we just wanted to do this thing. The Venture Bros. is probably the only the comedic animated series that not only has a story-arc but also a really rich mythology. Was that the plan from the beginning, or did it evolve as it went on? Hammer: Both, I would say. I mean, I think from the very beginning we were seeding back story or suggesting that there was back story and a rich history and we were dropping you into the middle of an adventure that had been ongoing, but we didn’t know what a lot of that stuff would be and it developed and got huge over time. I know that the fifth season doesn’t begin until next year and I know that you’ve been renewed for another season after that and a future special…do you see the series having an end or do you want to keep doing this as long as you can? Hammer: I think there is an eventual, kind of end to the series. I don’t know if we foresee an end to the Venture universe, but the series itself can only go on for so long, and, you know, when that is, that’s up to us, but Jackson and I are the kind of people that would give you a proper ending and not just pitter it away. Publick: There’s always, like, little legal issues with single episode and we’re constantly baffled by the…we apparently don’t understand parody law. Very confusing (laughs), but nothing big, certainly no big story things that anybody has put the kibosh on. Hammer: I think that all of the story things that we don’t do are because they’re not appropriate, it’s self-edited stuff. There’s a lot of things in the show that I’ve fantasized. I would love to do hours and hours of like, Team Venture or what goes on with Billy and Dwight that has nothing to do with The Venture Bros., but that isn’t the network telling us to stop doing it. Our discipline is that we’re writing for The Venture Bros., and we have to keep the show inside the established and move forward in the Venture universe. 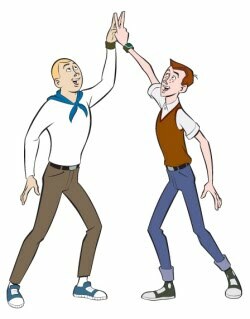 I think that both Jackson and I have all these ideas that are tangentially related to The Venture Bros. that we would love to do, but we don’t because we’re quasi-disciplined (laughs) and really busy. 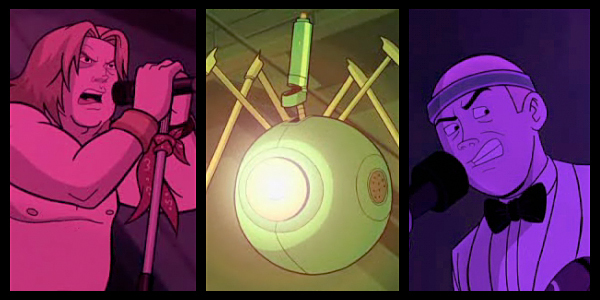 At this point, you have a large body of work with this animated series, do either of you have a favorite episode? Publick: Yeah, I like them all and I hate them all…there’s like a million “I-should-haves” attached to every single episode and sometimes the ones that were the most fun to write and that I thought would be the best one ever just kind of didn’t end up that way. But I think they’re all good. Is it a surprise to you that it’s kind of found that audience? Hammer: I can chalk it up to there is a kind of sensitivity to our show that’s absent in most of these kinds of shows, if there are these kinds of shows. There just isn’t anything like this, but we have a fairly continuing narrative, we have a lot of, it’s action, but if you really think about what’s happening, what happens is characters are really being brought out. That’s what our show is, the advancement of these characters and I would hope that men and women would find that interesting, so it doesn’t really surprise me. There’s obviously influences on the show in terms of references that you guys make, but who or what would you say are the biggest influences on your work and it doesn’t necessarily have to be a direct influence on the show but just in terms of inspiring? Hammer: I geek out over The Venture Bros. (Laughs) I geek out over what Jackson just wrote. I geek out over ideas we talk about. I geek out over the crap that we’ve already done that I want to move forward in…I really am immersed in this crap and that’s my biggest inspiration is what we’ve done. Publick: That’s true. Yeah, it’s become that. I mean, probably the seeds were planted by everything we’ve watched in the 70s, like James Bond and the Pink Panther and Monty Python and everything and Marvel Comics and crap and all of the syndicated 60s and 70s crap that we watched in the 80s was also in it. That’s all been absorbed and processed and crapped out as our own version of it, now it’s our kind of world to play in, just kind of get off on screwing around with our own characters. Would you ever want to see The Venture Bros. universe be translated into another medium, like into a comic book miniseries or even live action adaptation, or do you think that the animated series is pure and that’s what it is, and everything else would detract from it? Hammer: Maybe someone will fall in our laps. 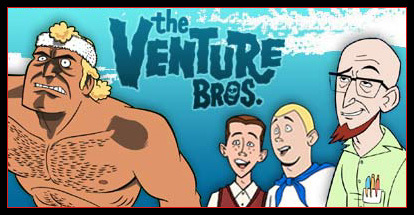 To watch The Venture Bros. episodes, including the new special, visit the Adult Swim website HERE! Special thanks to Chris Hunter for transcribing this interview!